This is a neat solution to the problem and provides important data. In my cloud cosmology, what is produced is hydrogen and only hydrogen and all else is a product of star formation. It is worthwhile to know that we have a natural and continuing balance of mass between the galaxy and the surrounding envelop which is real is itself as an artifact of the gravitational fields. It is plausible to posit an internal steady state of star creation and star destruction for every individual galaxy with little at play between galaxies. Not enough though to make an anti galaxy a good idea though. At least we now have direct insight into the make up of all that gas. Galaxies have a voracious appetite for fuel - in this case, fresh gas - but astronomers have had difficulty finding the pristine gas that should be falling onto galaxies. Now, scientists have provided direct empirical evidence for these gas flows using new observations from the Hubble Space Telescope. The team led by Nicolas Lehner, research associate professor at the University of Notre Dame, is presenting its work at the meeting of the American Astronomical Society in Long Beach, Calif. The team's observations using Hubble's two ultraviolet spectrographs, the Cosmic Origins Spectrograph and the Space Telescope Imaging Spectrograph, show large quantities of cool gas with very low quantities of heavy elements in the gaseous cocoons surrounding modern galaxies. Led by Lehner, the team of astronomers identified gaseous streams near galaxies through the absorption they imprint on the spectra of distant, bright background quasars. The atoms in the gas remove small amounts of the light, and as the light from the quasars passes through the gas around galaxies, the chemical elements leave characteristic spectral "fingerprints" that allow astronomers to study the physical and chemical properties of the gas. Lehner and collaborators searched for the signature of gas within about 100,000-300,000 light-years of galaxies, identifying this gas due to its strong hydrogen absorption, a known signature of circumgalactic gas. They subsequently determined the amount of "metals" - all elements heavier than hydrogen and helium - in this gas to test whether the circumgalactic matter was being newly accreted from intergalactic space and lacking in metals or being ejected from the galaxies themselves and strong in metals. "Astronomers have been searching for this infalling gas for a while," notes Lehner. "However, due to observational limitations, they had to search for metal-poor gas using the metals themselves. Since there is a tiny amount of metals in this gas, it was difficult to find in that way." The new work uses ultraviolet spectroscopy to identify the gas through its hydrogen absorption, which is independent of the metal content. This has allowed the team for the first time to determine how heavy elements are distributed around galaxies in an unbiased manner. Lehner and colleagues estimated the amount of metals in the circumgalactic medium of galaxies over the last six billion years. They found that the distribution of heavy elements abundances in circumgalactic gas has two different characteristic values, around 2 percent and 40 percent of the heavy element content of the sun. Both branches of the metal abundance distribution have a nearly equal number of gas clouds. Meanwhile, the circumgalactic gas probed in this study was also found to have a mass comparable to that of all the gas within the galaxies themselves, thus providing a substantial reservoir for fueling continued star formation in modern galaxies. This study confirms the earlier finding by the same team that metal-enriched gas is widespread even far from the galaxies themselves, likely sent there by strong outflows driven by supernovae. The metal-rich gas likely traces winds and recycled gas from outflows and galaxy interactions. The metal-poor gas is in quantities of metals too low to trace even in very low-metallicity galaxies that are six billion years old or older. It very likely traces cold streams onto galaxies; its properties are in very good agreement with those seen in the computer simulations of galaxy formation and evolution. "One of the big questions remaining from our study is what types of galaxies are associated with these gas clouds," remarks Lehner. 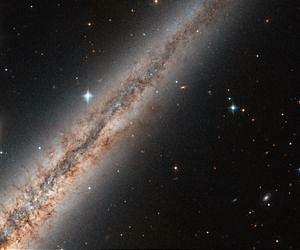 The luminous components of most of the galaxies in the current study have not yet been identified. This team will use the Large Binocular Telescope, Keck and other ground-based telescopes to reveal the nature of the galaxies. "Independent of the interpretation, our findings place new constraints on our understanding of how elements are distributed around galaxies," Lehner concludes. "There is not only a large mass of metal-rich gas around galaxies in the modern-day universe, but also a significant mass of metal-poor gas that may become available for star formation." This new work also implies the more diffuse intergalactic medium far from galaxies in the modern universe may be far more metal deficient than previously thought.